As violent protests continued to grow on Paris streets in France for the third weekend in a row, the anti-Macron movement seems to be growing. The protesters and rioters known as ‘yellow jackets’, which is derived from the safety vests they wear, which are required of all citizens to carry in the back of their automobiles. 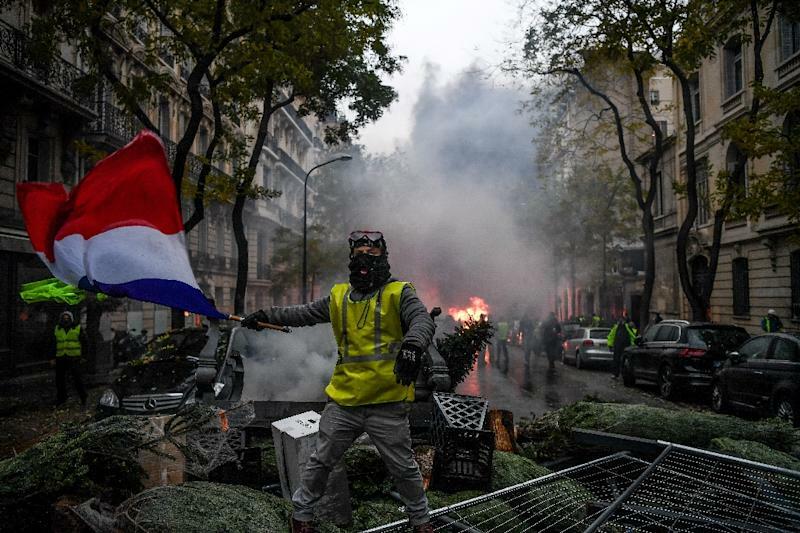 The riots began and have mushroomed into a movement, as the French people have been saddled with exorbitant gas prices, due to the Progressive-Socialist policies of the radically progressive Macron government. It all began, as the government implemented their progressive ideological agenda, and said that they were working to rid the nation of fossil fuels. Therefore, the government placed increasing and progressively increasing taxes upon the people, it created a massive burden on the French citizenry. It reached a boiling point three weeks ago, as protest began to grow in the streets. Quickly, those protests grew into riots, as Macron vowed to remain steadfast in his progressive agenda. As a result, the riots continue to grow and have not only endured for three weeks, but they have grown and flourished. In fact, when Macron threatened to impose a ‘state of emergency’, French firefighters turned their back on him. Furthermore, when Macron returned to Paris from the G-20 Summit, he was booed by the protesters, as they torched cars, smashed windows, and looted stores. As the protests grew, and Macron sent in the police to put down the protests with water cannons, pepper spray, and rubber bullets. However, the protesters responded by throwing rocks at the police, torching cars, and smashing windows, as Macron ordered in the police to arrest them and restore order, but to no avail. VIDEO FOOTAGE BELOW. President Macron shows no mercy. Orders the police to shoot at people. A French-language correspondant of Russia Today was hit by a rubber bullet in the face. French police fire tear gas, water cannon at protesters in #Paris! Two people have died and more than 1500 others have been injured during the week of demonstrations. Now, as the riots not only continue, the French ambulance workers have joined in with the rebellion against Macron and his radically left-wing progressive socialist government. To make matters even worse for Macron, on Sunday the French Police approached the protesters, but instead of a continuation of the previous attacks with rubber bullets, pepper spray, and water cannons as Macron ordered, the police removed their helmets, and showed solidarity with the yellow jacket protesters. Unfortunately the peace didn’t last, as the Macron government refused to back down. Therefore, the protesters continued to riot in the street, demanding action. Macron’s government has been trying to formulate a response, but the government is not prepared to roll back their unpopular agenda, which includes massive tax hikes that they have already imposed. 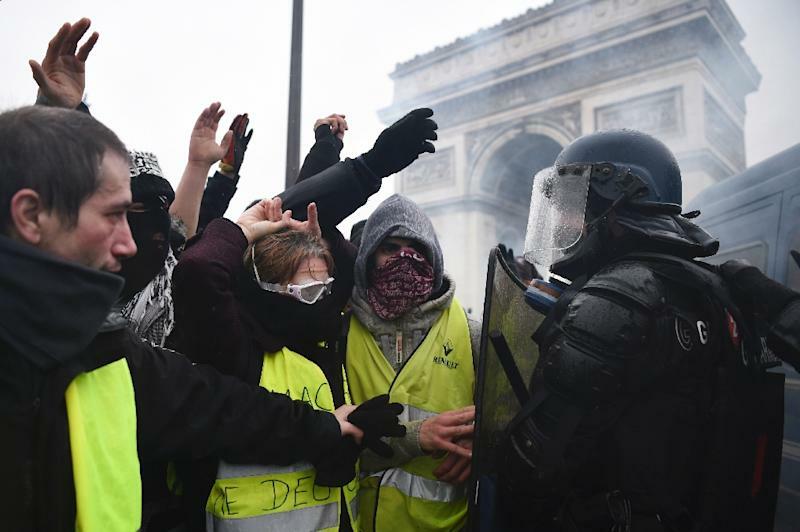 As a result, what started as a fuel tax protest, has ballooned into a whole wave of resistance issues, as demonstrators are now calling for reforms to much of the economic reforms that have been implemented by the Macron government. Macron, was elected in 2017 on a pro-business platform. He had promised job growth and bringing jobs to France. However, almost immediately after he took power, he pushed through and implemented major tax cuts for the wealthier businesses and entrepreneurs, but not for much of the middle class. Combine the tax cuts for the wealthier French people, with higher taxes for the middle class on especially fossil fuels, only fueled tensions, which led to the eventual protests and now riots in France. At the onset of the protests, the demand that was made by the protesters was the ending of the fuel tax. In fact, it was a “prerequisite for any discussion”, according to protest leaders. “Mr President, we need a response,” Le Parisien newspaper. “Swamped, Paralysed by the yellow vest movement that it can’t stop and that risks boiling over,” Libertarian newspaper. As of Tuesday, it now appears that even the student population in France is beginning to grow restless, and is gathering momentum to join in with the ‘yellow jacket’ protesters. In fact, French student protests had grown and even intensified with the younger protesters showing more incidents of violence, setting buildings on fire, and being more violent towards the police, with violence spreading to the French cities of Lyon, Marseille, Bordeaux, Orleans, Creteil, Versailles, and Paris. As a consequence of apparent and impending tensions and violence, the French Prime Minister suspended the nations planned increases on fuel tax for six months, but he did not reduce it. Ultimately, as tensions continue to grow, and as opposition to the Macron government continues to rise, France could see an escalation of tensions, protests, and even violence. Therefore, it currently appears that control over the nations directory is no longer in the hands of Macron, or his progressive and globalist allies in France, but instead is in the hands of the French people. Amazingly, it now appears that left-wing and right-wing ends of the political spectrum are joining in the protests, and demands are growing, as the government appears to be stalling, which could present further complications, as well as escalation of tensions. Le Maire also pointed out how lower-income families are struggling, and so reducing tax burdens is necessary, due to the French tax burden being the highest in Europe. In the meantime, as of Saturday, the fire department have put out 190 fires, and there have been 412 arrested, and 263 injured, and 3 killed from the protests and riots, as businesses grow weary and concerned about how long the standoff will continue. However, that is a question that leaders from both sides would like to know, but no-one can unfortunately answer. Youre so cool! I dont suppose Ive read something like this before. So good to search out somebody with some original ideas on this subject. realy thanks for beginning this up. this web site is something that’s wanted on the internet, someone with a bit of originality. useful job for bringing one thing new to the internet!